It's here! 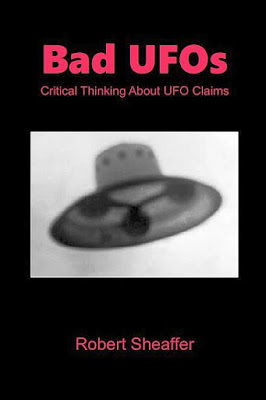 My New UFO book "Bad UFOs"
At long last, the book everyone has been waiting for (ha ha)! My New UFO book, "Bad UFOs." Steven Greer's "Disclosure Project" and ET Contact Protocols. 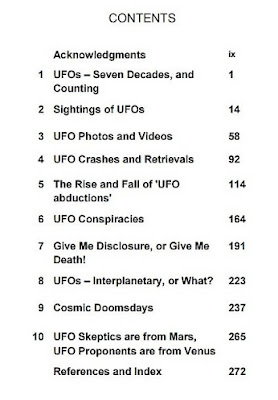 Here is the Table of Contents of the book Bad UFOs. The list price is $18.95 (plus shipping). And if you order it from this link, you can enter the discount code Y8ZHYK6Y and get 10% off the retail price. You can also order the book from Amazon.com. But in that case, there will be no discount. 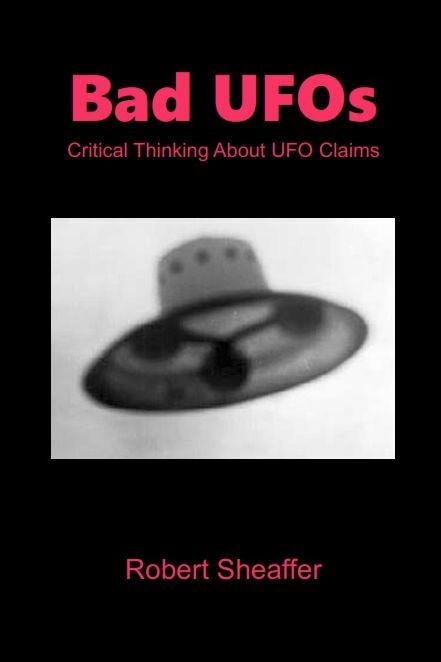 For those who prefer the Ebook format, Bad UFOs is also available from Amazon on Kindle. The E-book is only $8.95 (no discounts available). In my previous posting dated January 2, we saw Kathleen Marden's absurd charges that the letter I posted from Dr. Simon dated March 1, 1976 is "fraudulent," because its contents are most inconvenient for her and contradict the story that she is trying to promote. Somebody claiming to be "Paul Westfall," a Master's degree student in psychology at UC Berkeley, posted a comment to that Blog entry which exactly parallels Marden's argument that Dr. Simon's letter is a "forgery." 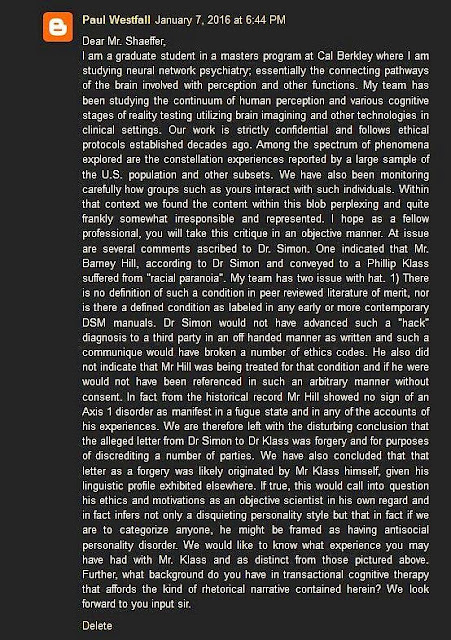 Putting on the airs of a psychology professional, he basically says that what Dr. Simon wrote in that letter is full of crap, and accuses Klass of forging it. 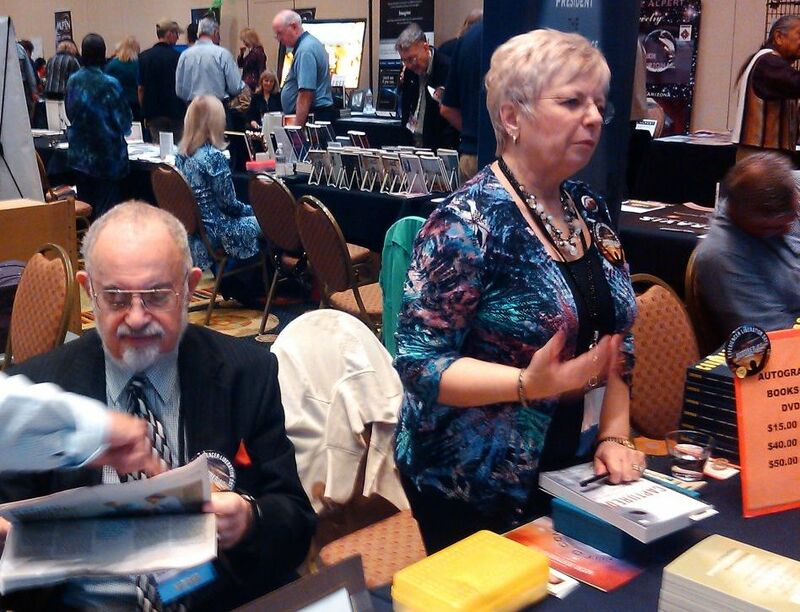 Stanton Friedman and Kathleen Marden selling stuff at last year's International UFO Congress. But I smelled a rat as I started to look into this. At that same time, I unexpectedly received an email from the very wise Ted Molczan, telling me that he smelled a rat, too. Your letter above is rather peculiar, especially inasmuch as you say that 'your group' has been monitoring 'my group'. Sir, I don't HAVE a group here. It's just me writing. "We have also been monitoring carefully how groups such as yours interact with such individuals. Within that context we found the content within this blob perplexing and quite frankly somewhat irresponsible and represented." I seriously think that this is quite bogus, as psychology researchers at a prestigious university have better things to do than to read Blogs such as mine, and complain about them. Here is the current directory of psychology graduate students at UC Berkeley. It is nicely in alphabetical order. There is nobody on that list named "Westfall." Also, Cal Berkeley DOES NOT HAVE a Master's program in Psychology. It is a PhD program only. You, sir, are a fraud. Who put you up to this????? Is this "Paul Westfall" a real person? Or is he a sock puppett created by Marden or one of her staunch defenders? It's a "Forgery," Marden Charges!! Yours Truly with Kathleen Marden and the "Flying Saucer Physicist," Stanton Friedman, at the MUFON Symposium, 2011, perhaps in happier days. I realized that this ran counter to what Kathleen Marden, Betty Hill's niece and heir to her celebrated Saucer Story, was saying. What I didn't realize is how fiercely invested Marden is in preserving the illusion that Dr. Simon accepted all of the Hills' account as being factual, including the abduction story. I received an email message from Andre Skondras on Christmas day informing me that debunker Robert Sheaffer, an associate of Philip Klass and longstanding member of CSI (formerly CSICOP) , had found a never before published letter allegedly written to Klass by Dr. Benjamin Simon. The letter dated March 1, 1976, was mailed by Klass to Betty in 1988. It spoke of Dr. Simon’s intent to “give the true story of the Betty and Barney Hill affair.” It is our opinion that Dr. Simon would not have stated that his untested, unproven conjectures were the truth. He was circumspect and professional in voicing his opinion. The intentions voiced in the letter would have been a violation of his contract with John Fuller and a violation of doctor-patient confidentiality. Of course, that confidentiality had already been breached, with permission, by the entire commercial enterprise exploiting the Hills' account, including John Fuller's 1966 book The Interrupted Journey, and by 1976 the NBC-TV movie dramatizing their account, The UFO Incident. Once a story gets that far out into the public eye, and questions arise about its interpretation, you can't claim that further discussion constitutes a "violation." Once the Hills' sessions with Dr. Simon have become pillars of support for the pro-UFO abduction argument, you can't release that information selectively. the Today show [Oct. 20, 1975] was the first time I did this openly to the public at large [state his skepticism about the abduction account]. A few days later I did the same thing on the NBC TV station here, WBZ, which resulted in Betty telephoning and implying that I was lying when I said (what you have said in your book) that Betty's sister [Marden's mother] was much interested in UFOs and served as a stimulus, and that the idea of a true visitation had been suggested by her narration in the presence of her sister and her supervisor. She promptly telephoned WBZ and undoubtedly was looking for my appearances and affirmed that her sister was not interested in UFOs and that she had never told the story. Aside from the fact that this is a lie denying her own statements on the tapes we also received a letter from Betty's mother proclaiming that while I have the right of free speech, I was telling lies abasing her beloved daughter! I revealed the entire story on an hour an a half radio show with Larry Glick. So that is the true dark heresy, which cannot be admitted: that Betty's sister was a UFO buff, and encouraged Betty's fantasies. Every time this was mentioned, Betty Hill (and now Kathleen Marden) would pop up to deny it. But here we have Dr. Simon saying that it's true. I had thought about publishing the letter in my book Captured! The Betty and Barney Hill UFO Experience, with Stanton Friedman, but decided not to, due to uncertainty about the identity of the writer. Betty had marked "Forged Letter!” at the top of the letter. Now, it does not surprise me one bit that Betty Hill had said such an absurd thing. Mrs. Hill wrote and said many absurd things, and not just about her famous UFO incident. Even Marden admits in her book Captured (p. 275), "After Barney's death, she turned away from careful, objective evaluation, and with subjective enthusiasm began to identify any lights in the sky as UFOs." 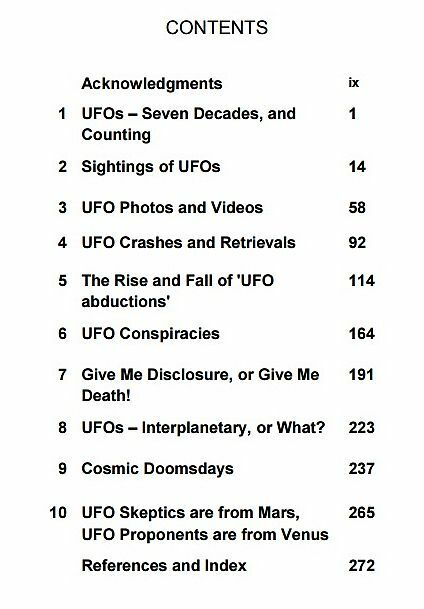 Although as I showed in my review of this book in The Skeptical Inquirer (November/December, 2007), after Barney's death was not the only time Betty Hill said absurd things about UFOs and aliens. There is much evidence of Betty making wild UFO claims with Barney sitting right beside her. I have had it and other letters that Dr. Simon wrote to Betty examined by several individuals, including three who were close to Dr. Simon, and all believe it is probably a forgery. The style and phraseology were not characteristic of Dr. Simon's writing. An important piece of information is the fact that Dr. Simon signed a non-competition clause with John Fuller. He could not have legally written a book. It is doubtful that Klass would have known this. 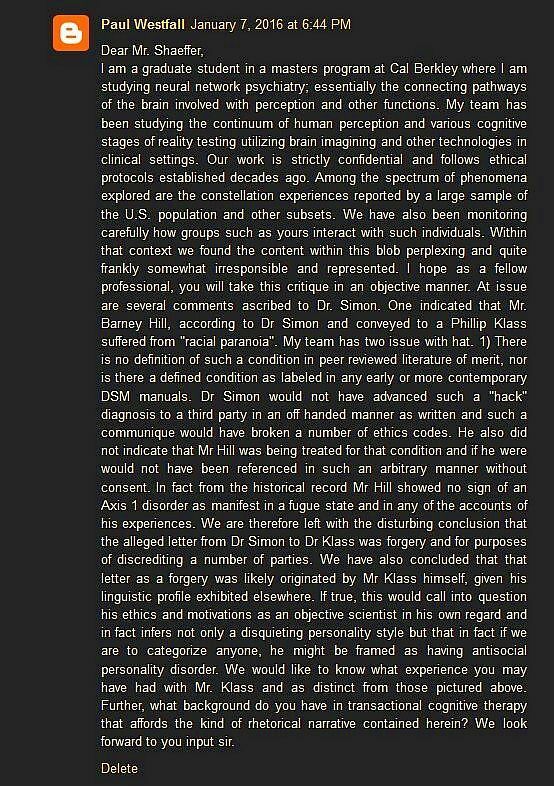 Dr. Simon was circumspect with regard to sharing his opinions about the Hill case, and it would have been highly uncharacteristic of him to opine or violate doctor-patient confidentiality. Between the two of us, Marden and I have recently posted four letters from Dr. Simon, three from me (one of which she claims is a "forgery"), and one from her. As I understand it, she has clarified her claim to mean that only the letter if March 1 is a "forgery," the others are genuine. If you're inclined to believe her absurd claim, I urge you to compare the four letters. They are all very similar. None of them are "forgeries. "And in all of them, Dr. Simon maintains the same thing: he believed that the Hills had a "sighting" (as do I), but he believed that the abduction story was not real and came from Betty's dreams. How did Barney learn about Betty's dreams? Betty always maintained that she never told him about them. But as Dr. Simon explained on the Larry Glick show, Betty was telling the truth saying that she did not tell him directly. However "she did tell it in Barney's presence [to Betty's sister, and her supervisor], and that's where he got it." You will hear Dr. Simon describe the abduction account as a "fantasy," and plainly state, "the abduction did not happen." Perhaps Ms. Marden will say that this recording is a "forgery," too? If you click #5, you can hear Dr. Simon on Larry Glick's radio show, saying more "heretical" things.